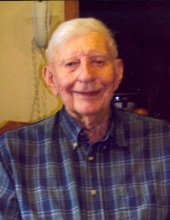 Paul Fritcher, age 99 of Boone, passed away November 14, 2018 at the Eastern Star Masonic Home in Boone, after a brief illness. Following his wishes, Paul has been cremated and no visitation or Memorial Services will be held. There will be a Graveside service held at a later date with military rites to be accorded. Paul Bruce Fritcher, was born in Boone, Iowa at the family home on August 4, 1919, the son of John and Serena (Phipps) Fritcher. Paul attended a county school near his home. He started hunting at a young age to provide food for the family and hides to sell. He worked on the farm until serving in the United States Navy during WWII as a torpedo man’s mate on the U.S.S. Pompon. He married Effie (Chris) Ahrens on August 12, 1946 and lived at Paul’s family home together for 71 years. Paul was a member of the American Legion and was a life-long Chicago Cubs fan. He enjoyed visiting with family and friends and being outdoors enjoying nature. In his younger years, he enjoyed hunting. He is preceded in death by his wife on December 14, 2017; his parents and two siblings, Florence (C.L.) Feagins and Robert “Chay” Fritcher. Paul is survived by his son, Joe (Deborah) Fritcher of Boone; daughter, Jody Fritcher (Danny Metcalf) of Boone; three grandchildren, Serena Rognes of Ankeny, Jason Fritcher of West Des Moines, and Nathan Fritcher of Boone; three great-grandchildren, Carter, Bryce, and Reid Rognes and a nephew, C.L. “Butch” and his wife, Velma, Feagins of Fraser, and their families. In memory of Paul, memorials may be directed to the family. To send flowers or a remembrance gift to the family of Paul Fritcher, please visit our Tribute Store. "Email Address" would like to share the life celebration of Paul Fritcher. Click on the "link" to go to share a favorite memory or leave a condolence message for the family.